Beach tents are compact and elegant tent that is heat and water resistant and serve as an ideal shelter for delighting, slouching and unwinding. These tents are highly functional, stylish and sturdy and are used in hotels, restaurants, beach resorts, sports pavilions, farm houses and receptions. Beach tents offered by us are highly appreciated for their long applicability, light weight and water and heat resistance. 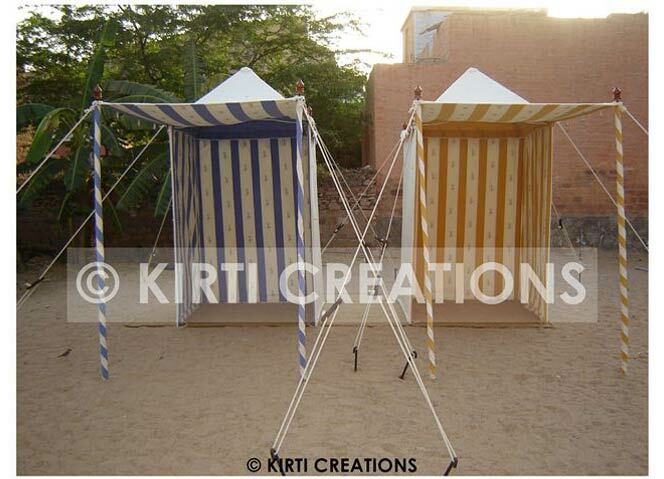 We offer a wide range of beach tents which are made available in different sizes and colours. Our tents are user friendly, reasonable and you can enjoy the scenic beauty. The evenly spaced blue strips on white background gives a magnificent and stunning look to the whole attraction of Handmade Beach Tent. The beautiful white dome shaped roof on the top of Handmade Beach Tent top is an integral part of its elegance.